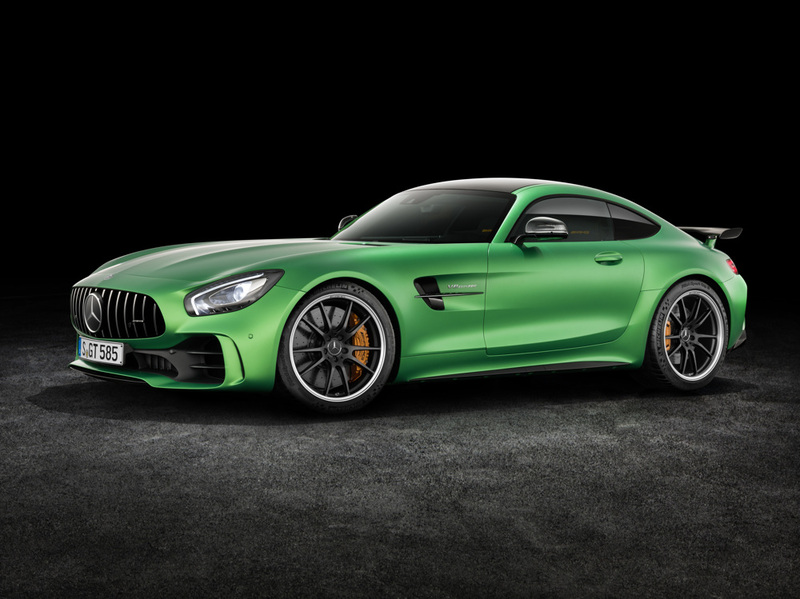 Mercedes-AMG is done screwing around. 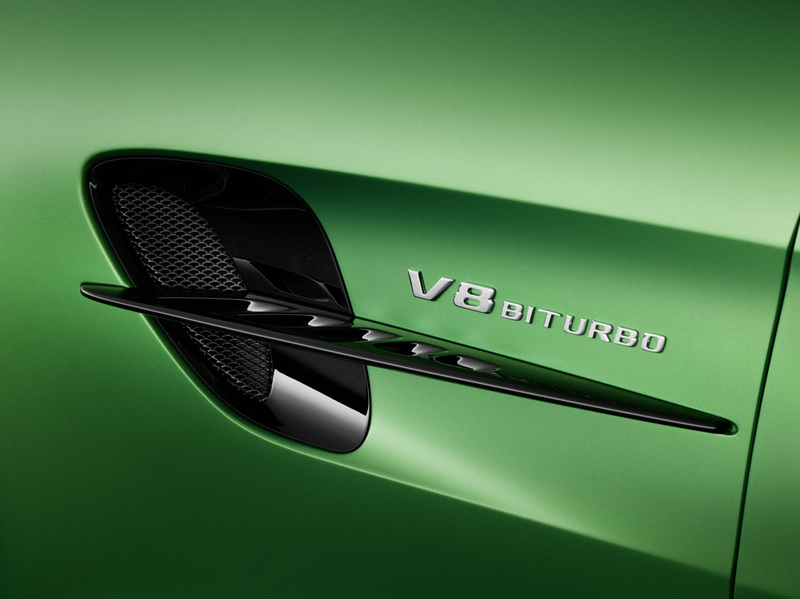 The days when a slightly warmed over E-Class was fit wear the badge are done and dusted. 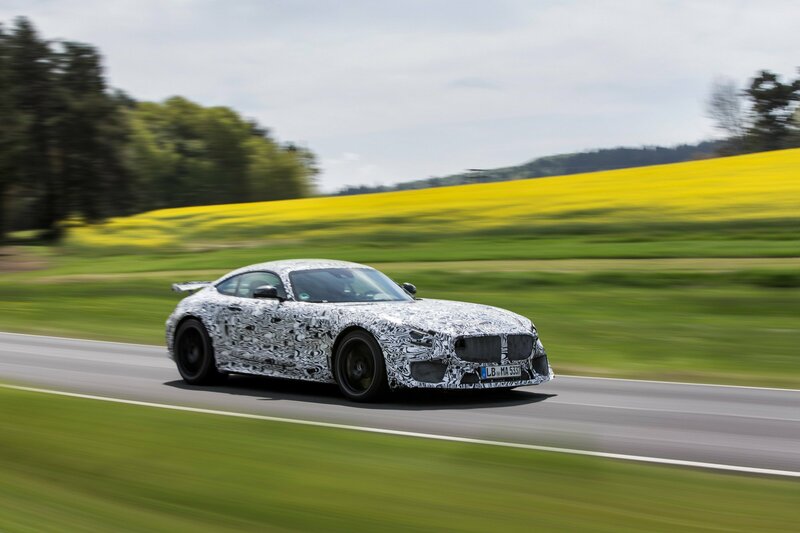 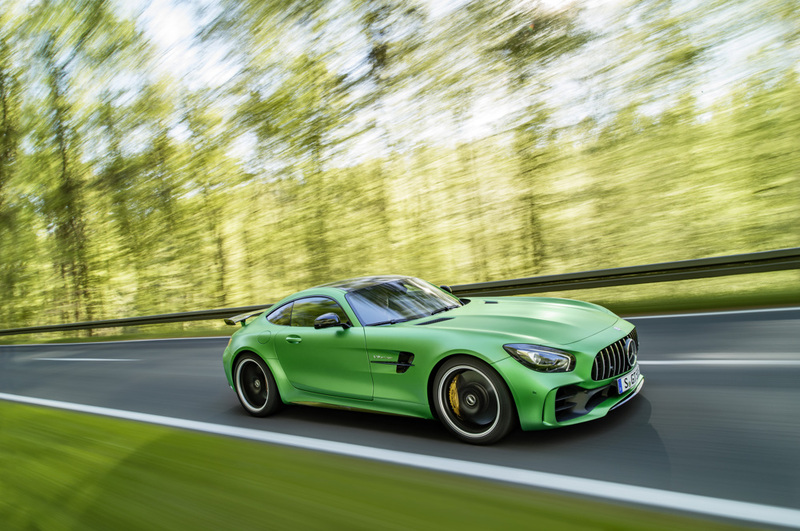 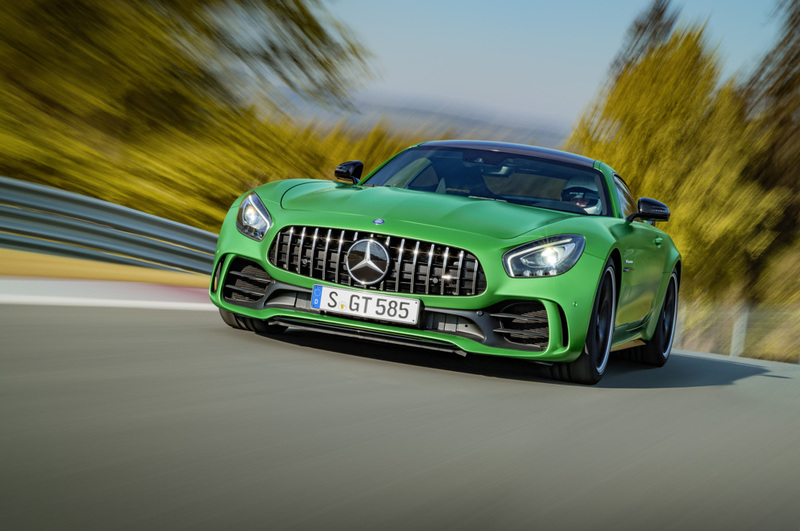 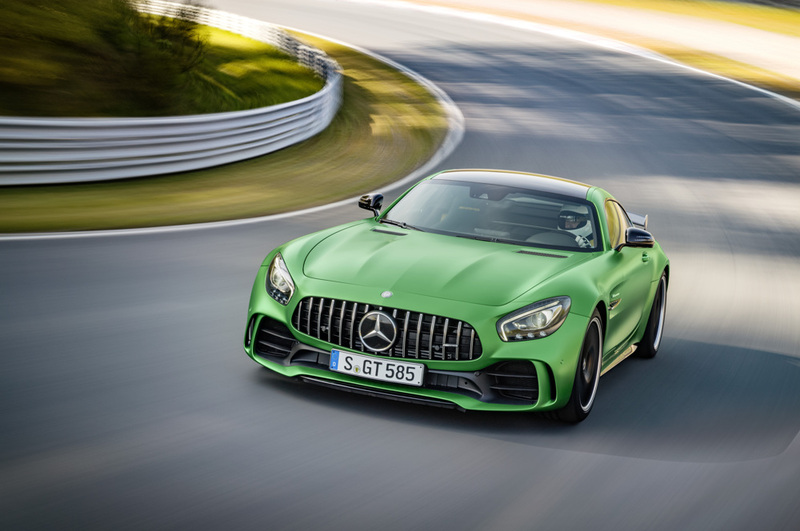 Mercedes’ performance arm has upped its game significantly over the last few years, and the Nürburgring-bred, 577-horsepower AMG GT R is its clearest sign of intent yet. 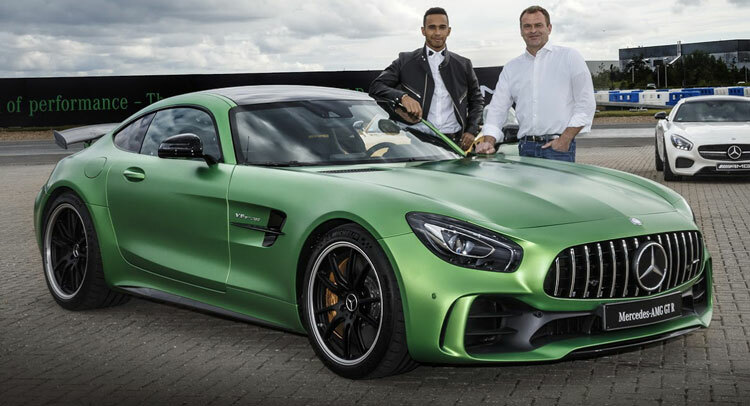 But, before we tell you more about it, watch this rather awesome teaser, featuring Mercedes-AMG F1 driver and 2015 F1 World Champion, Lewis Hamilton. 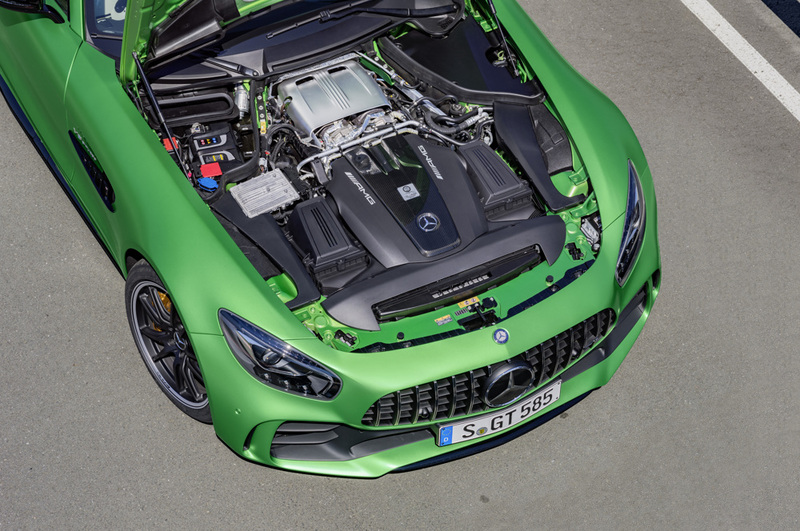 That terrifying noise you hear attacking Lewis and his co-expeditioners is an even more unhinged variant of AMG’s 4.0-liter, twin-turbo V8, tuned to produce 577-horsepower at 6,250 rpm and 516 lb-ft of torque from 1,900 to 5,000 rpm. 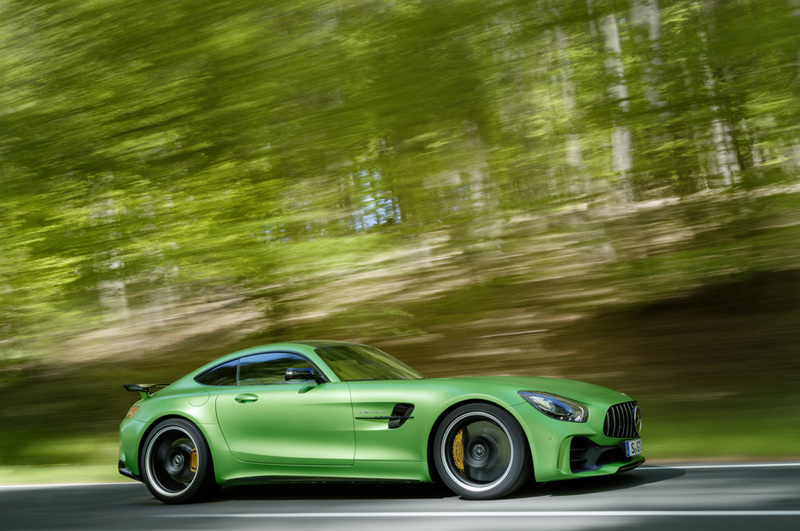 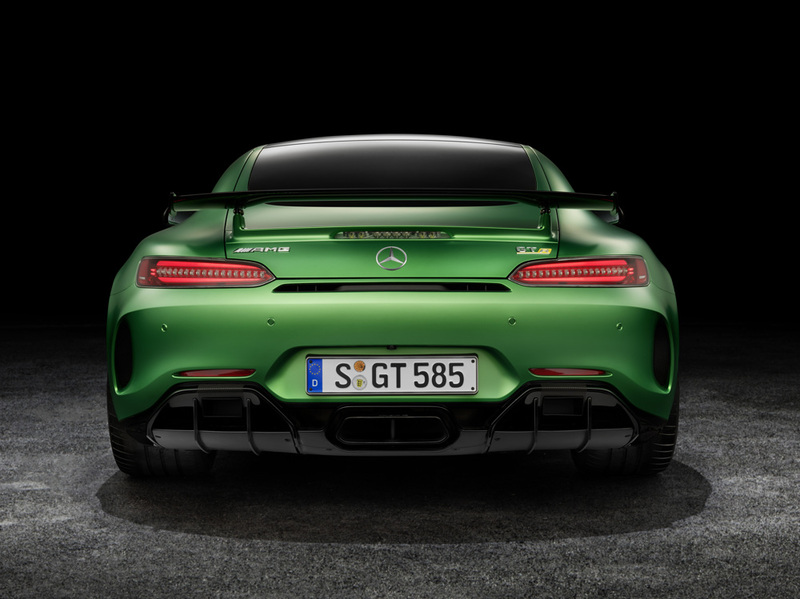 Mercedes claims a 0-60 time of 3.5 seconds and a top speed of 198 mph, but the AMG GT R isn’t only about straight-line speed. 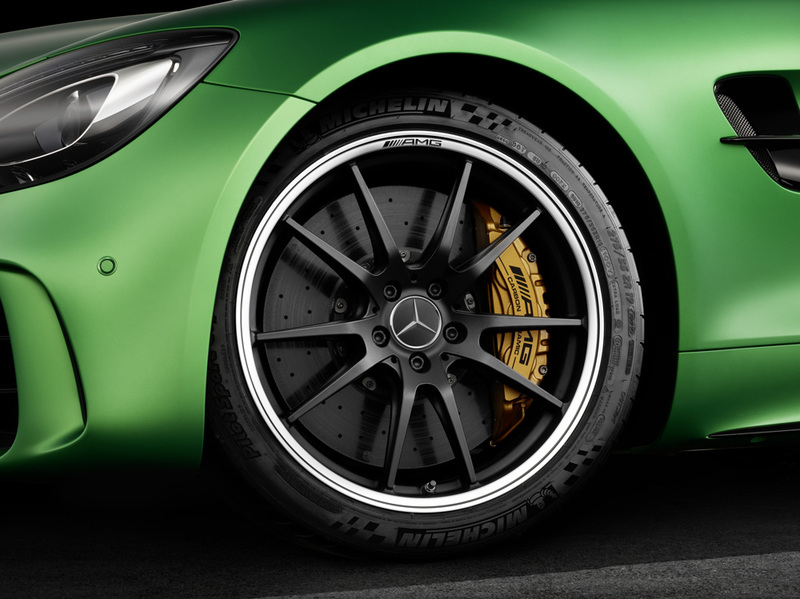 Its primary directive is to dismantle race tracks. 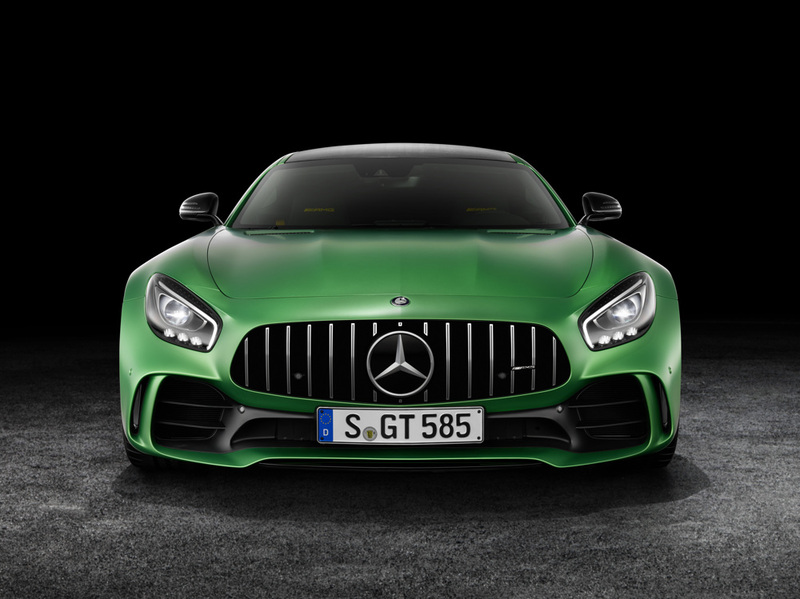 With wider front and rear tracks, ground-scraping splitter, substantial rear wing and double diffuser, the GT R looks like a road-going version of the Mercedes-AMG GT3 race car that recently swept the top four positions at the Nürburgring 24-hour race. 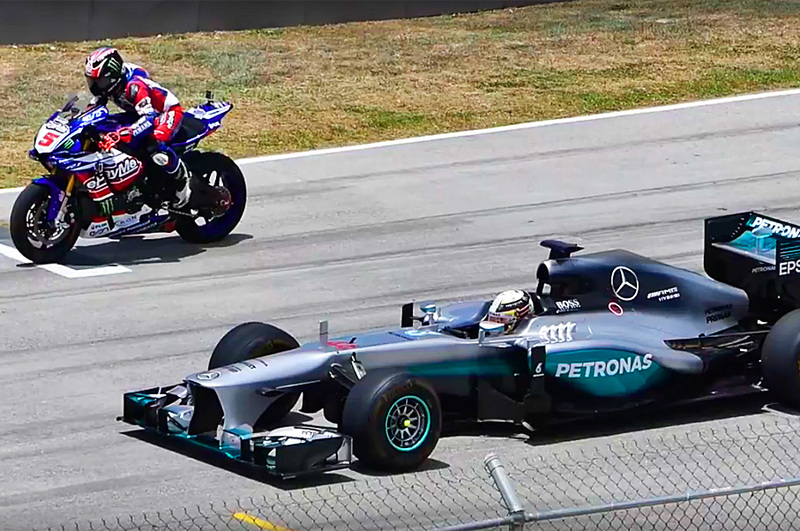 That’s not an entirely fair comparison. 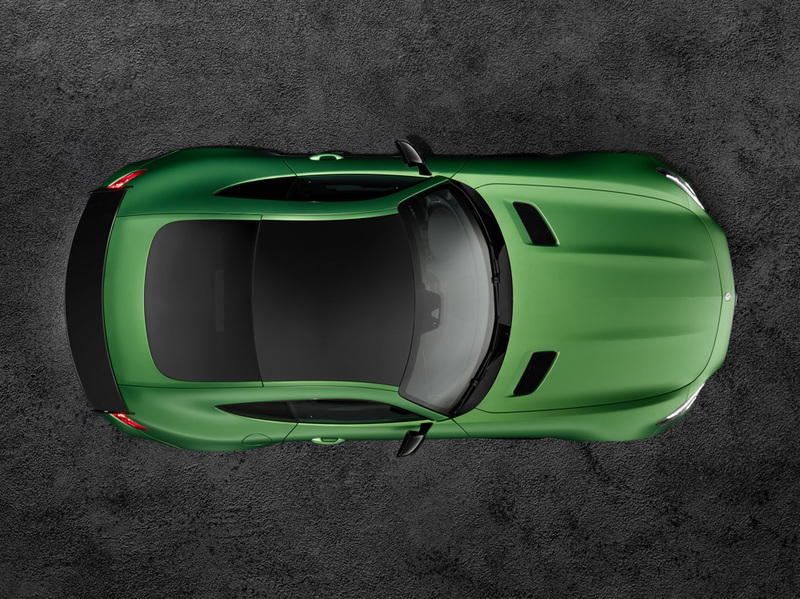 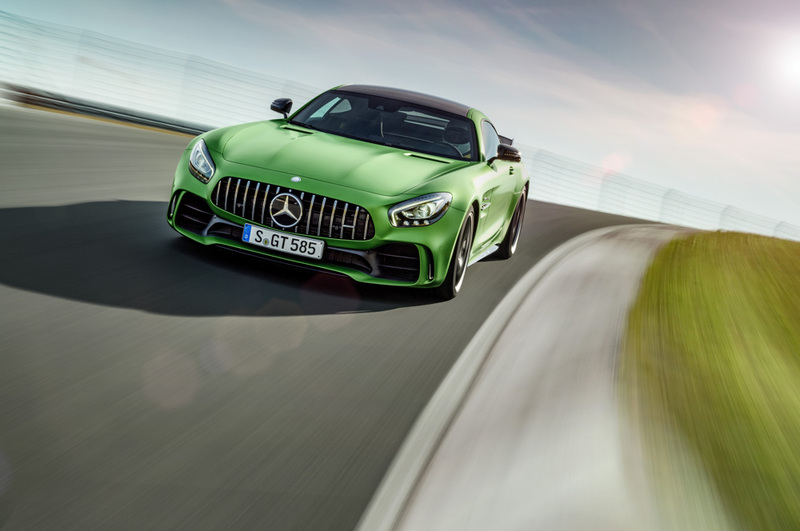 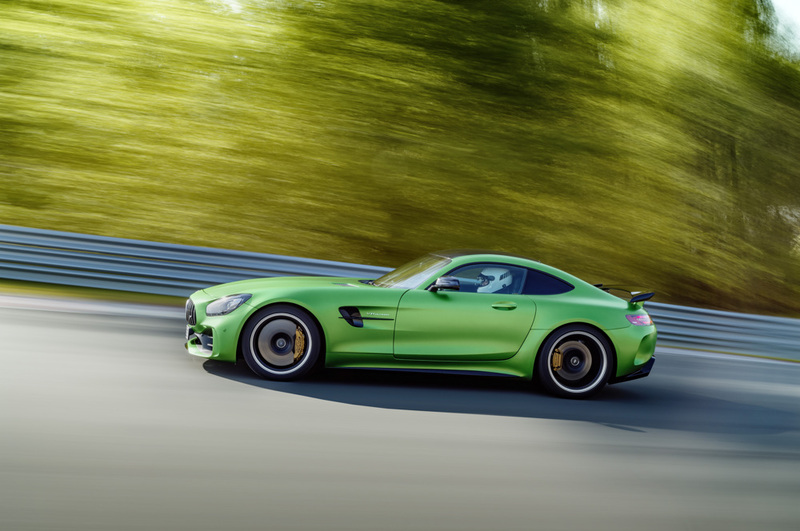 The AMG GT R uses several tricks that have long since been banned in the realm of race cars. 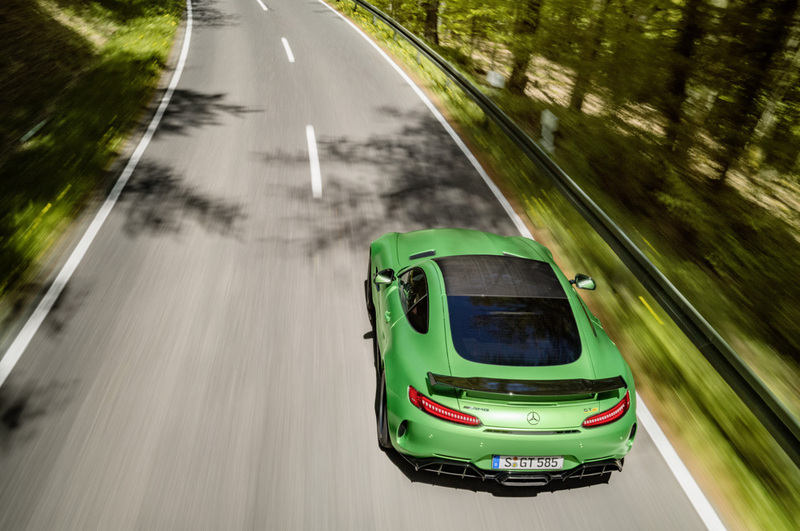 First, active aerodynamics. 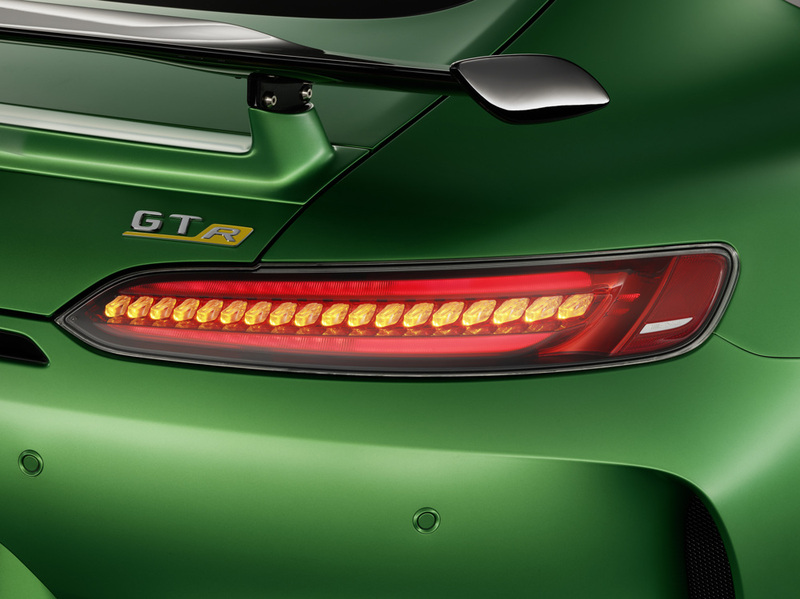 When set to Race mode (why would you have it set to anything else? 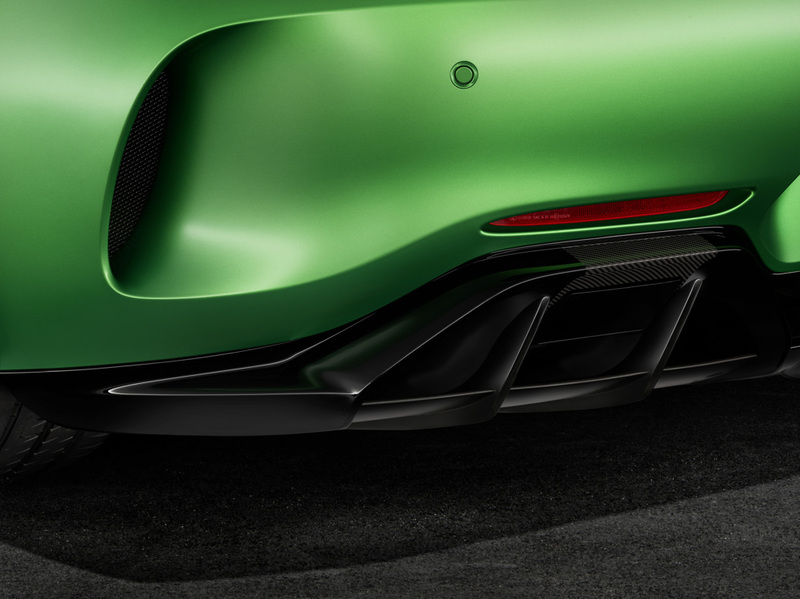 ), a carbon fiber panel in the underbody moves about 1.5 inches downward. 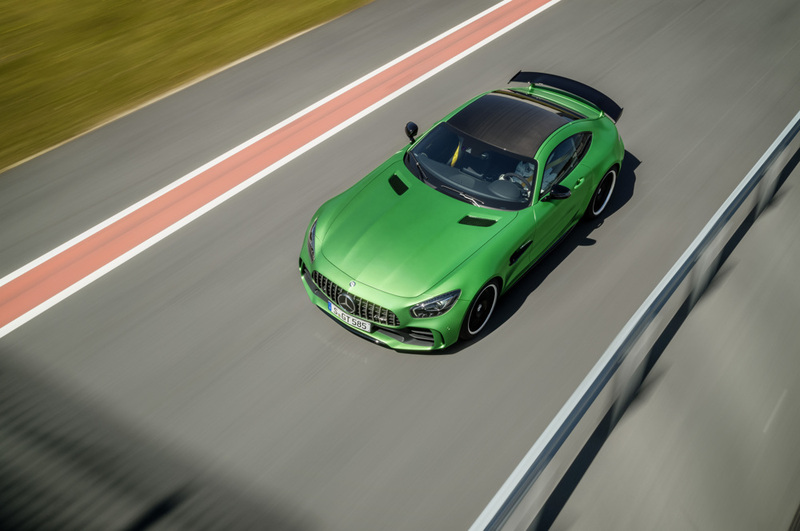 Mercedes says the redirected airflow increases agility by putting an addition 88 pounds of downforce on the front axle. 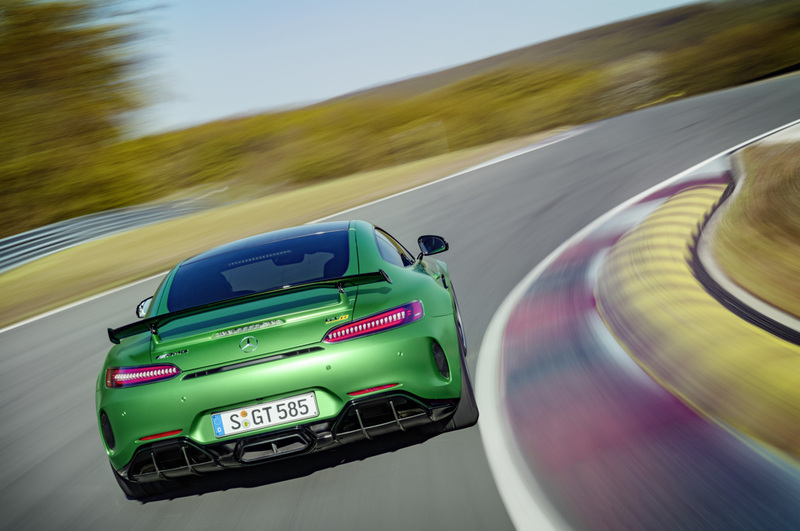 With active rear-axle steering, Mercedes has also taken a page from the Porsche 911 GT3’s playbook (or the 1987 Honda Prelude if you want to get pedantic). 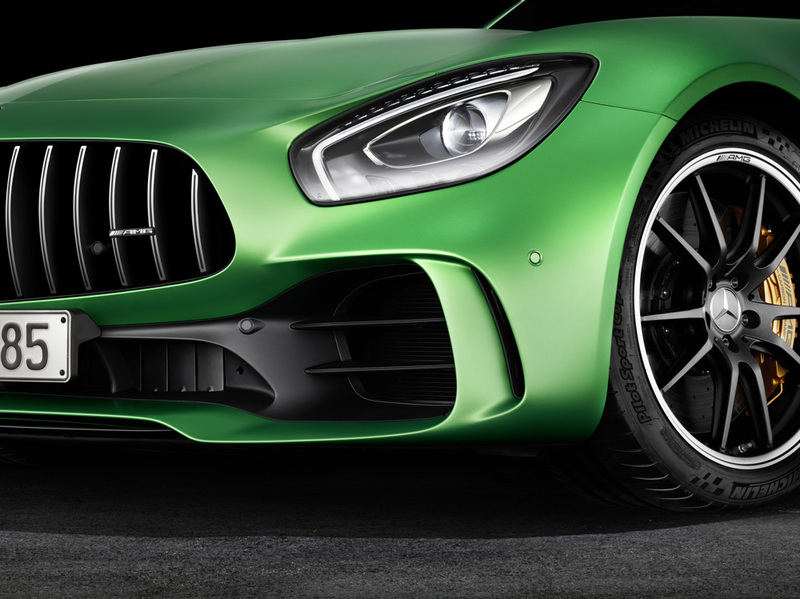 This new system adjusts rear-wheel toe angle within a 1.5 degree range, which improves handling in low-speed corners. 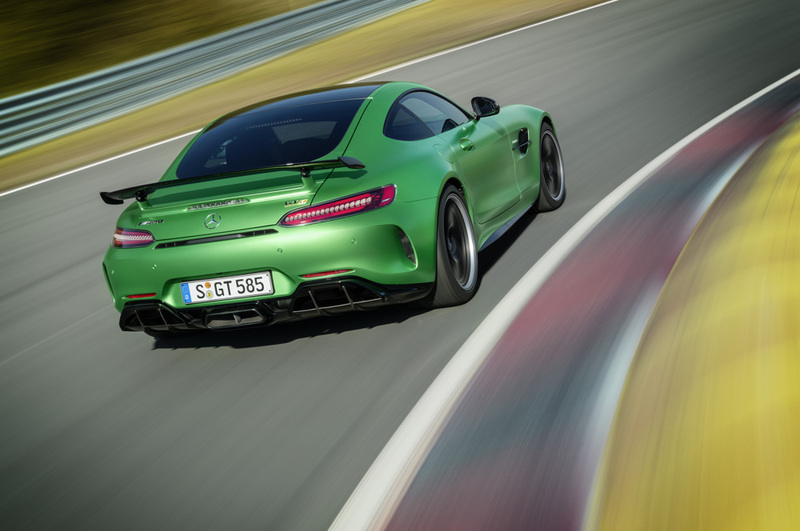 With a curb weight of 3,428 pounds it’s also appreciably lighter than the vanilla AMG GT, and a 47-52 weight distribution means understeer shouldn’t be an issue. 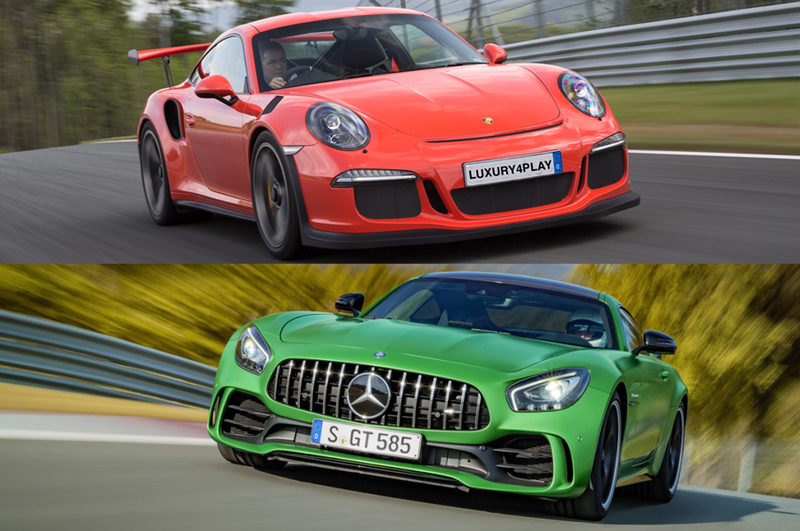 It’s about 400 pounds heavier than its natural rival, the Porsche 911 GT3 RS, but the GT R’s significant power advantage gives it a nasty power-to-weight ratio of 5.94 pounds per horsepower. 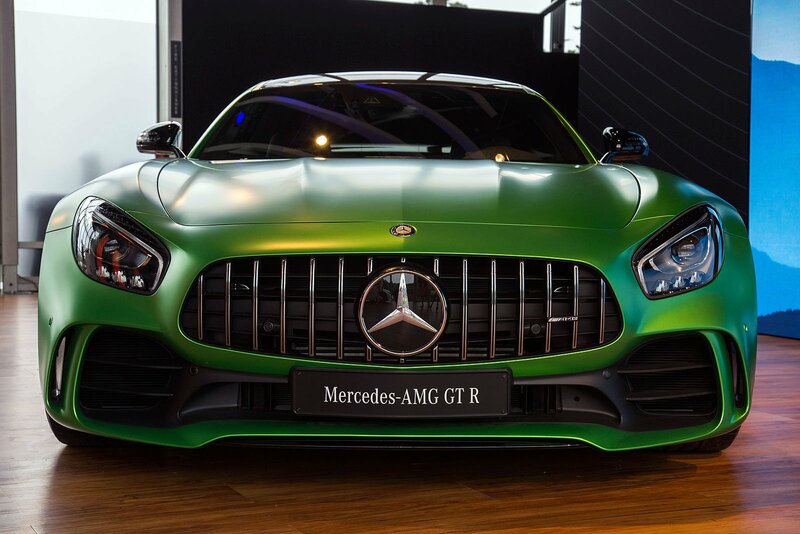 Finally, you’re probably wondering about that green paint job. 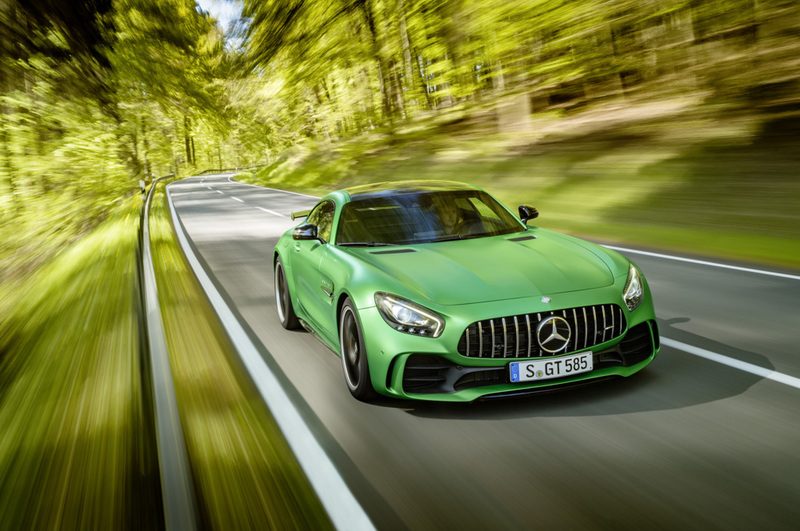 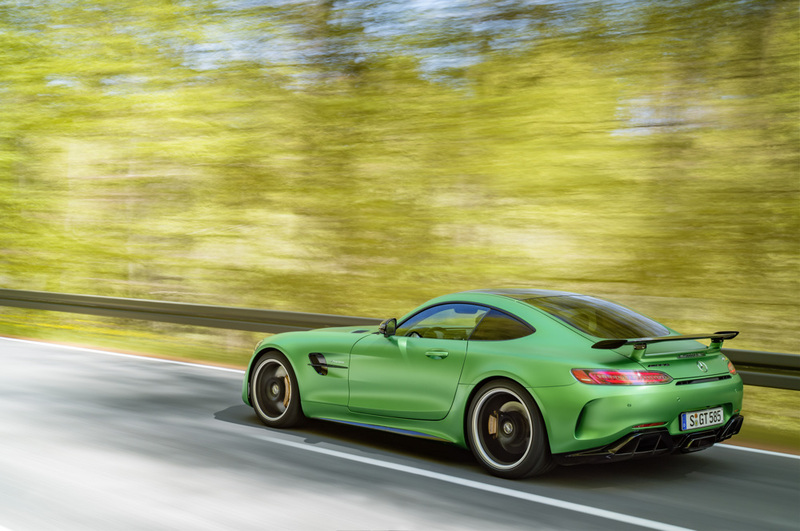 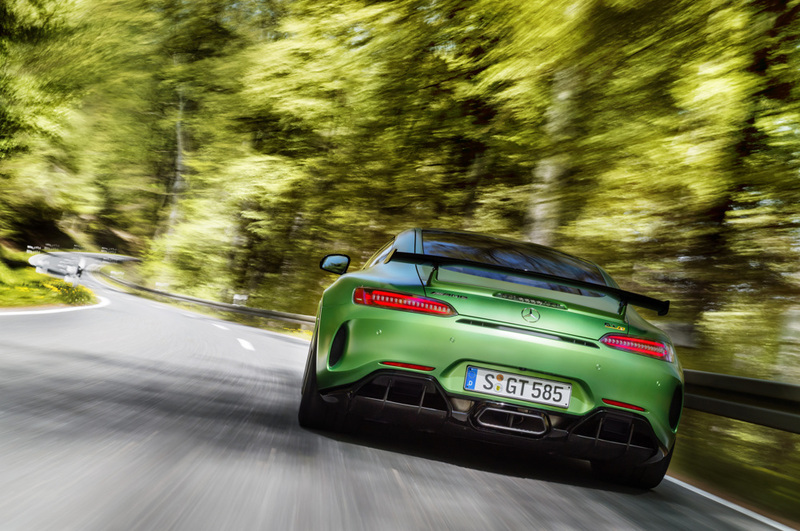 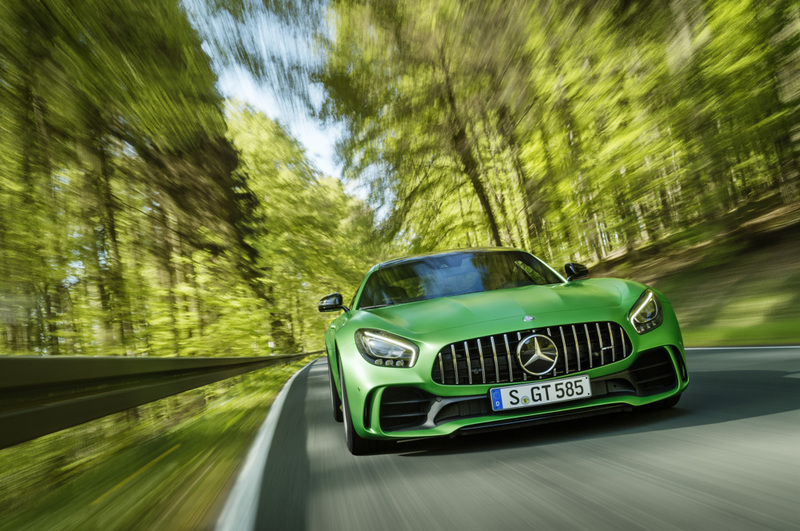 Mercedes calls it AMG Green Hell Magno. 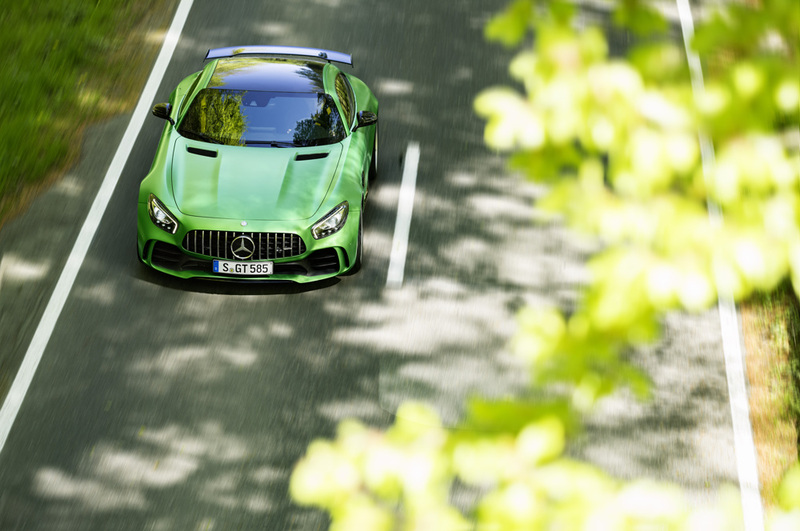 It was inspired by the GT R’s development time on the Nürburgring, which Jackie Stewart famously christened The Green Hell. 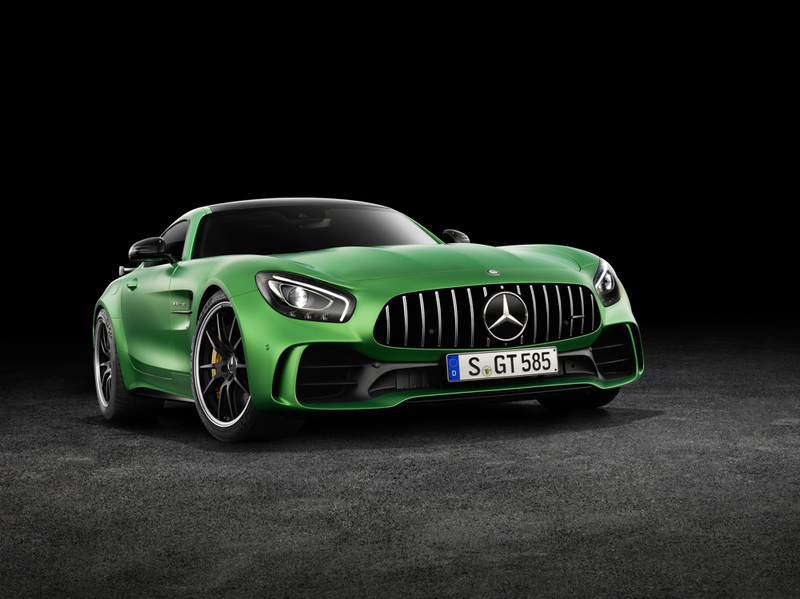 It probably wouldn’t be your first choice, but presumably the GT R will be available in other colors. 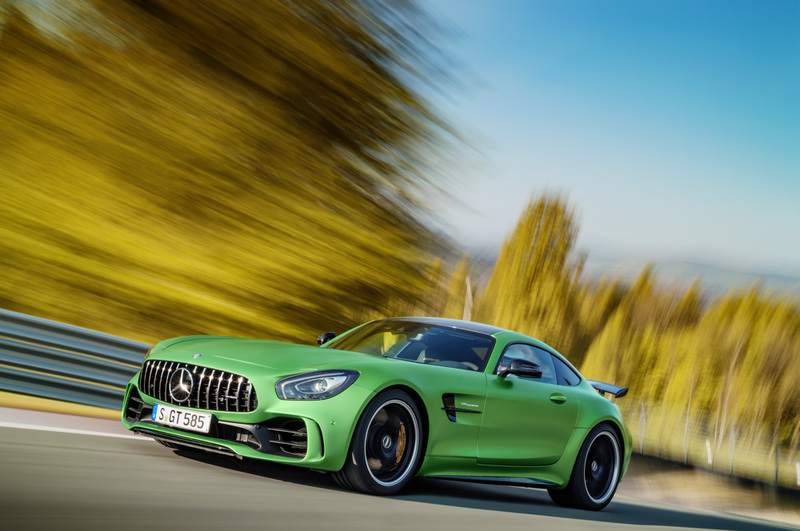 Pricing is yet to be announced, but you should probably call your nearest Mercedes dealer now if you want one. 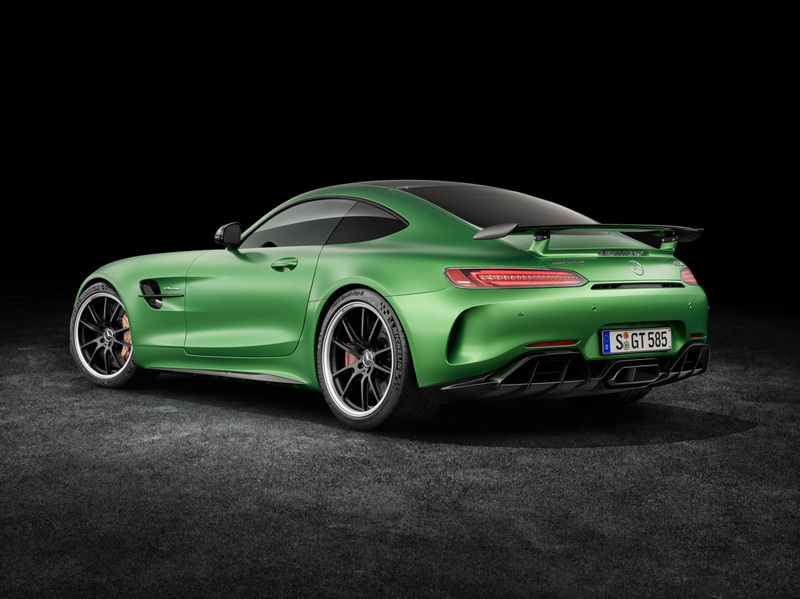 Deliveries start mid-2017. 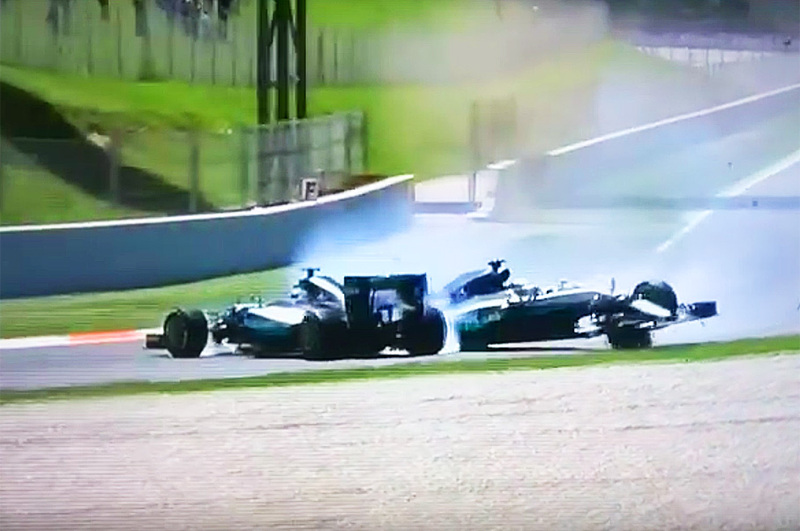 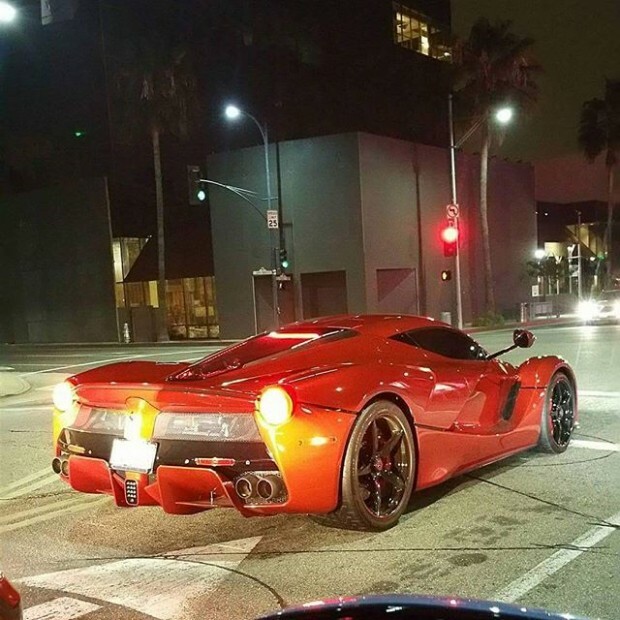 Did Lewis Hamilton Just Cause This $14-Million F1 Crash With His Mercedes Teammate?